Water Gas anyone? | Miscellaneous Circuits and a link. Here is an example of something that should work in theory to aid gas mileage. While there are a great many systems being sold- virtually all of them are overpriced for what you get. I am only presenting generalized information here, which can be used to modify an existing system if you purchased one, or just enough information for you to construct one if you feel the iniative. I only present the MOSFET version, as this just a theoretical excercise. You can use a stack of Bipolar transistors if those are readily available to you. I am somewhat skeptical in general to the whole matter, but do not rule out the potential of such systems. I do know the real limitation is the induction system of the engine and the engine itself. I do think such a system would work best with rotary engines. The reason being the inherent thermal efficiency of the piston driven engine and the limitations brought about by mechanical drag within. This type of system should not be confused with the simple “Water injection” systems that have been used over the years- the best results being from injecting water and ethanol into the manifold when an engine is placed under load. Such a system was used with good results, From some German fighter aircraft of World War 2 era and prior, to those who installed them in their motor vehicles in the 70s and 80s that were nothing more than a windshield washer pump dumping a meterable amount of water in from the air cleaner cover. I am rather talking the systems utilizing hydrolysis of water to produce what could accurately be called a “co-fuel”. First- Reduce rolling resistance of the vehicle. This means make sure your brakes are adjusted correctly, use a Molybdenum compounded wheel bearing grease, and do what you can to reduce air drag under and over vehicle. If you have a pickup truck, switching to a mesh tailgate, add a toneau cover or light shell, or install a length of plywood in the back of the box at an angle to direct air over the tailgate. it will need to be structurally strong, so bracing is a must- as is securing it in place. You want the sheet to extend from the bed up to at least the height of the tailgate. and it should rest at an angle between 45 and 60 degrees from the bed of the truck. Immediately behind the cab, a low pressure area develops. That low pressure area is adequate for a sheet of “foam board”- 1/2 centimeter or 1/4 inch thick to lift an inflated tire and wheel assembly at modest speeds off the bed of the truck. Second- If possible where you are, use Nitrogen in the tires to improve thermal stability and use “high pressure” type tires- these are typically rated for a cold pressure of at least 50 PSI. Third- Make sure engine is in peak tune. Fourth- For those that still have a carburated vehicle, the thing to remember is the amount of air flowing through the carburator determines how much fuel you use. Air velocity through the carburetor creates pressure zones and vacuum zones. These areas are by design and make it work. Air flow determines the fuel consumed. If you have an older engine that is running okay, take a look down the venturis when it is idling. If there is a steady stream of fuel into the airflow, this can mean your timing chain has stretched. The wall of the venturi should be a damp wet with gasoline, a stream of fuel means float level needs to be chacked and corrected first, and if the engine has 100,000 miles or more, and has a conventional timing chain- it has likely stretched. This will be evident when the float level has been corrected and it still flows out gas into the venturi. These vehicles usually run okay, but are hard or tempermental to get started, and an overly rich gas smell is evident while idling. Now would be the time to install a new timing set into the engine. With gas as expensive as it is, the fuel saved will pay for this repair quickly. Using a double roller chain is the best low cost solution as they do not stretch as much as the conventional chain. They are not always available for all engines that could benefit from them. They are noisier, but the trade off is durability. Fifth- If you are so inclined to install your own water gas generater/hydrogen generator, some hints to optimize the installation. Most people can fabricate their own electrolysis/reaction tank setup as it is merely a vessel you can add water into it, 2 stainless steel mesh electodes that do not touch are also present, and a tap for the generated hydrogen and oxygen gasses to be drawn off. They will be mixed, so they will be highly flamable. There is a tank that is part of a HVAC humidifier unit made in Germany, I do not have a name, I wish I did. They make a fully contained tank with two stainless steel mesh “electrodes” with terminals you can attach to easily, there are also a number of ports available. Some systems suggest adding a second alternator and battery, this can be helpful. Ideally what you want to do is produce an excess of watergas while you are slowing the vehicle to a stop. you want to be able to pressurize a reservoir tank if possible to provide additional watergas to the engine for acceleration. Therefore You need to make a suitable tank that will not corrode. Schedule 40 PVC can be used with a cap and fittings to achieve such a pressure tank. Use primer, and cleaner as well as the correct adhesive because you will be trying to store a flamable gas that will self support combustion. You are needing to create a significant amount of pressure, something well above that of the atmosphere, however with the time it takes for the reaction/electrolysis to occur, you are not likely to aproach the Schedule 40 ratings. That pressure is indicative of the creation of the water gas, it is also useful because if you double port- one to provide a metered flow constantly to the engine, and one that is variable, you can optimize the system to your liking. The second port you will need to modulate flow- more flow for times of acceleration, and less flow for times of braking. When you plumb the system, you need to tap into the manifold somewhere, a pretty good place is the PCV hose. The closer to the manifold, the better. This allows the water gas to enter the engine without drawing extra fuel through the carb or metered air induction of fuel injection. You also want to find, or construct a proportional valve that will control how much of the water gas is flowing into the engine at any given time. You could use a simple ball valve with a servo motor to open or close the valve, plus you would need to construct a logic board to open the valve under acceleration and close the valve for deceleration. You will also want to be able to inject water into the reaction chamber where the electrolysis of water takes place- this is because the gas created above the water that is there is under pressure. So you need to determine a way to meter the inflow into the tank that is under pressure adequate displace the pressurized gas above. You can use a simple water tank that is pressurized with compressed air, but you need to check to make sure that tank is full and has not absorbed the air or watergas before you drive anywhere. You can use a sensor on the side of the tank, such as a thermistor to signal a simple circuit to energize a simple solenoid valve to open and close as needed to maintain water level in the reaction chamber. Simple methods can also be used with 2 water sensor pairs of electrodes- one pair at the full height, and the other at the fill height. If a second alternator is installed, the energizing wiring should be wired in parallel to the existing charging system save for the battery connection which goes to the other battery. If for example you use a “Delcotron” 2 terminal or single terminal, or jumper the 2 flat terminals with a 10 ohm resistor and run to one wire- that “one wire” should attach to the same energizing wire for the other alternator- that one wire to connect to will measure 12 volts nominally with the vehicle ignition on and engine off, and no voltage (0V) when ignition is off. The other bolt lug terminal being to the second battery itself. Next; energize the reaction chamber. There are numerous approaches to this. Direct wire to the alternator is not suggested because the alternator can place a tremendous load on the engine. This load can be used for braking however. I would not suggest this for any vehicle with an A4LD transmission of any flavor, EA4LD for example. (they are just a Ford C3 Pinto transmission with an overdrive band and planetary gear set and NOT durable.) To simply an installation to make this work automatically (for the braking aspect) is to utilize a trailer brake controller, such as some of those made by Tekonsha. (ideally those with the knob you can adjust/apply trailer brake application. There are going to be differing views on this, but fundamentally to increase the watergas production- you need current more than you need voltage. 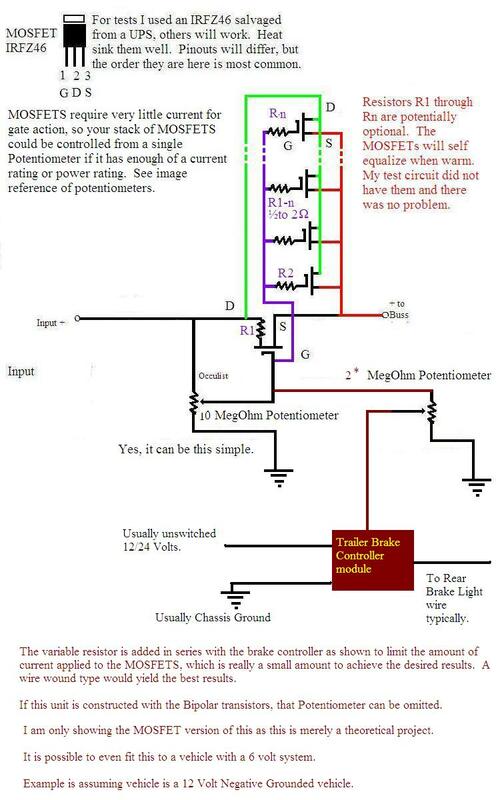 So, to achieve the brute force simple method where you can dump a great deal of current into the water gas electrolysis/reaction chamber when braking; is to use a stack of FETs on heat sinking, at least triple the current capability of the alternator. You should still use the voltage and current regulator for the alternator system you add. Wiring in a dash light in the manner of the original application circuit is a good idea as it both protects that alternator, and can give you a visual indication of the alternator’s ability to function with that status light under the dash board. With that stack of FETs- make sure all lead lengths are the same, and if you have ferrite beads, add them to the gate to reduce the chance for “Gate Ringing”. The gate should be wired to the lead off the brake controller that would energize the trailer brakes. You should also install a second variable resistor in the manner of the simple FET Regulator, essentially paralleling the brake controller. you will want to use a 5 or 10 meg Pot, or you will want to utilize a relay to remove this second resistor from the circuit if you use a lower value of resistance when the engine is off to avoid draining the battery. The Stack of FETs is not controlled by a semiconductor device, it is controlled via resistance. Make sure your wattages are adequate for the demands of the system. You will also want to locate the heatsinks where they will remain as cool as can be achieved with airflow across them. On first startup, you will want to adjust the variable resistor to a point where water gas is being produced, but no real loading of the engine is evident. Then you want to adjust the brake controller so it does load the engine- even if it stalls. But make sure to set it also so you can apply the lever control partway and get some engine loading without stalling so you can actually produce some watergas prior to starting the engine. That is about it, some additional optimization might occur with the use of a microprocessor to “tailor” the braking effects on the engine. I did converse with one fellow who had used an ignition coil wired essentially as a pair of resistors and achieved some resonance akin to that of a battery operated “weed burner” type of electric fencer to his electrolysis unit. It is something you can try. Higher voltage does not mean higher power though. I am only outlining this concept because it is only a theoretical excercise that “might” help someone. I suggest if you are adept with tools, build your own rather than buy one. With the information I have on this site, you should be able to optimize or modify an exesting watergas system. Unlike the others who try to resort to hype to try sell you something- the information in this post has the fundamental information that you need to construct one yourself and you did not have to pay for the plans- save your money. Lastly, where plastics are in use- make sure to accomdate their changing characteristics under heat. Again, this is just a theoretical application, I have not constructed this one (yet) I am not sure if I will, but in the off chance I do, I will post real results here. This entry was posted in Alternative Energy, Alternative Energy System, Homebrew, Uncategorized, watergas production and tagged browns gas, hydrogen generation, hydrogen generator, hydrolysis, power cell, Projects, save fuel, save gas, Voltage Regulation, voltage regulator, water gas, watergas. Bookmark the permalink.